- Student discounts are available to: full time students (of all ages) who hold valid Hong Kong student ID; or under 18 year olds with proof of age ID (remember, children aged 12 or under come for free). - The box office price is only valid for purchases on the door and includes on ground handling fee (Not applicable to online sales). 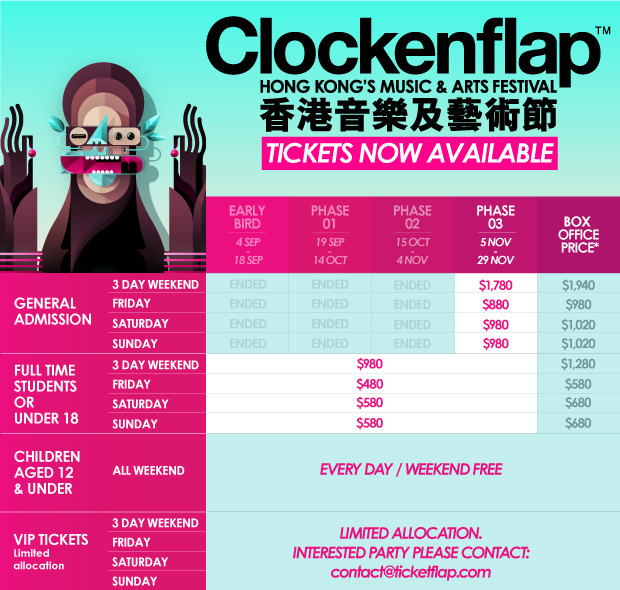 WE are beyond Excited to announce That this year's Clockenflap Will Take place at the West Kowloon Cultural District on the Weekend of 27th-29th November, 2015 . What's More, the 8th Edition of Hong Kong's Number one Music and Arts Festival Will be the Biggest the city has ever seen! Clockenflap 2015 features an incredible lineup of 150+ bands and DJs spread across more than 10 stages, as well as a smorgasbord of eye-popping art installations, mesmerising movies and many more intriguing attractions to enjoy. The festival will also feature a huge selection of drinking and dining options from some of the city's finest restaurants and bars, an expanded zone for families and kids, and the return of the ever-popular Clockencraft market. Make sure you bag a ticket for the biggest and best Hong Kong music & arts event of the year! Artist/Line up is subject to change.